The 'Secret War' in Laos had a secret city, and this was the remote, hidden base known as Long Tieng, south of the Plain of Jars. 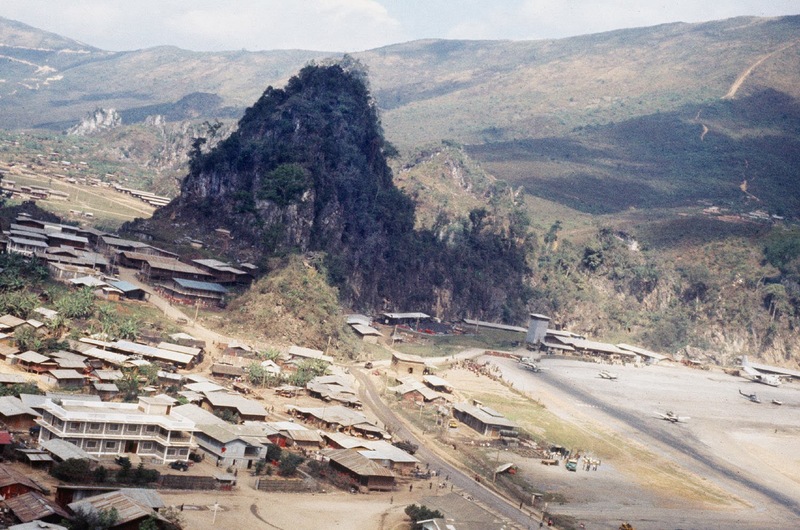 During the long war in Laos, it was the busiest airport in the country. For years it was a key air base for the CIA’s Air America, and US spotter pilots. It was also headquarters for famed general Vang Pao and his 20,000 strong Hmong militia. To the communists Vang Pao was Public Enemy No. 1, and the general lived in his mountain hideout with thousands of Hmong families that had fled the fighting. Many ethnic Hmong villages were destroyed during the war. As with many things connected to the Secret War, Long Tieng did not officially exist, and wasn’t found on any public maps. This was odd since at its peak, this ‘secret city’ sheltered 40,000 people, making it the second most populated city in Laos back then. Its cover was blown in 1970 when two foreign journalists snuck in. As major fighting ended in 1973, Long Tieng was taken over by the communist government, and it’s been their base ever since. Vang Pao left for exile in the US, joined by thousands of Hmong refugees. He settled in California, though he never forgot his mountain homeland, and his long suffering people still fighting the communists. In 2007, he was arrested near Fresno, charged with plotting to overthrow the Laotian government. The charges were later dropped, and he died in California in 2011, still a hero to the Hmong community. I’d like to see his infamous base, but as I’m being denied, I hear a tone of concern. The Laotian explains that real danger is involved. “There are still guerrillas fighting up there,” he says quietly. Despite my inquiries, he won’t elaborate further. Just like I had heard in Vang Vieng, there are still groups of Hmong holding out up in the mountains. They’re not only hiding, they’re resisting, and with force. Since seeing Long Tieng is out of the question, I book a trip to another seldom visited place, the once destroyed town of Muang Khoun. The next day, I’m on my way there. I’m looking down at antique European tile. Decorated with intricate handmade designs; interlocked circles are interspersed with diamonds. The tile’s original colors have faded; it’s now mostly black and white. The bright green color now surrounding the tile beneath me, is what has been reclaimed by the environment. Grass and weeds have taken over the floor as the decades have gone by, re-covering the tiles with a natural carpet. These natural grasses are able to grow inside this building, because the roof is gone. The tile, the arched doorways and the windows give away the origin of the former occupants. This was the French commissariat, and now it’s just a bombed out shell. Where the old darkened plaster has fallen from the walls, another color has peered out, that of bright orange brick underneath. I’m in the former provincial capital of Muang Khoun. Back when it was the capital, this town bore the same name as the province; Xieng Khuang. It’s not just old French buildings that were destroyed here, practically the whole town was leveled by US bombing as the North Vietnamese Army invaded. After the NVA occupied Xieng Khuang, Hmong troops later retook the town for a while, although they couldn’t hold it. With most of the country rural, there wasn’t fighting in Laotian cities very often, and here was an exception. In decades that followed, the town has been re-inhabited, but old tensions from the war still remain. In 2000, fighting erupted again in this region between minority Hmong and ethnic Laotians over a land dispute. Some homes were burned to the ground, five ethnic Laotians were killed, and more were wounded. As has happened before, the military came in to put down the Hmong uprising. The number of Hmong casualties from these events are unknown. Today I’m stuck with another Laotian guide, so unfortunately the Hmong who remain here won't tell me about the troubles, since an ethnic Laotian is present. Much of Muang Khoun has been rebuilt, and the town now has around 14,000 people living here. Centuries old Buddhist temple in Muang Khoun. This Buddha statue survived the bombing. The rain picks up, and we leave the ruin to wait out the weather in our SUV. I ask my translator to turn on the radio, but in this remote region there's little selection. He finally tunes into an AM station. As rain pelts on the roof, I listen to a Hmong singer, accompanied by Laotian music. My guide explains, “This radio (station) paid by UNDP. (United Nations Development Program) It’s the only station you can receive here.” In between music, they give the listeners health and hygiene messages. The rain lets up a little, and we walk down the road, finding the remains of a temple ruin. A group of geese waddle by me, as I climb the front stairs. This is called Wat Piawat, which means ‘biggest wat’. My guide says it is 600 years old, though experts say it's less. This once grand temple is from the old kingdom of the Lao Puan. Like so much of Laos, they would later be subjugated by the Thais, and the Vietnamese. Not much of the temple has survived. Up on a raised platform, some old pillars reach skyward. Much like the French colonial structure, the roof is gone, and sections of bare orange brick walls remain. Given the destruction of the rest of the temple, it’s amazing that a tall Buddha statue is mostly intact. Only an arm and the head have been damaged, The stone Buddha is seated, reaching higher above the rest of the ruins. Despite the temple’s condition, the local Buddhist faithful still have occasional ceremonies here. I note that a bright orange sash is wrapped over the icons shoulder, with a few offerings left at the base. Hopping back into our vehicle, we make a final stop in town. After parking the SUV, my guide directs me up a hill. It’s a steep dirt road, and he’s afraid of getting the vehicle stuck in the rain. He warns me to stay out of the deeper grass to the side. As I head up, I wonder why he warned me about the grass. Rising high ahead of me, I find a large old Buddhist stupa coming into view atop the hill. Somehow this stupa survived all the heavy bombing, though it isn’t intact. There is a great hole that has been dug through the base, going all the way through to the other side. This is unlike any stupa I’ve ever seen before, it’s mostly covered with grass and brush, and it’s also leaning to one side. As I look at it from a distance, it resembles an old pointed wizard’s hat. Like all stupas, the interior of this tower once held relics or artifacts, but they were removed by looters long ago. The offending tunnel was dug straight through the stupa by Chinese Ho invaders in the 1800’s. I’m learning that it wasn’t just the 1964 - 1973 war that destroyed Laotian heritage. This had also happened to earlier generations, from invasions by the Chinese and Vietnamese. I walk through the tunnel underneath, and looking up, I can see lighter colored stone; part of an older stupa encased within the larger outer one. I ask my guide about the stupa’s history, and for once he doesn’t offer much. The relic is somewhat of a mystery to the local population. They don’t know how old it is, or what it’s original purpose was. From the stupa platform I look to a nearby hill, and see another ruined stupa, destroyed almost down to the base. Sadly, there are many of them around town. My guide says there used to be more than 30 wats and temples in Muang Khoun before the war, and all were destroyed. He laments that if the war hadn’t happened, this town would have become a UNESCO world heritage site, much like beautiful Luang Prabang is today. On the way back down the hill, my guide discovers a leech on his ankle. Now I understand why he told me to stay out of the deep grass! He quickly kicks it off into the brush, before it can dig into his skin. Since I also walked through grass, I’m surprised that the leeches didn’t latch onto me as well. Maybe they prefer Asian food to American food.